Tested to harsh Mil-Spec environmental standards, MP helps assure military vehicles perform reliably in the extremes of the arctic or the desert. Vehicle accessories, IED detection equipment and motorized lifts operate safely protected by MP. 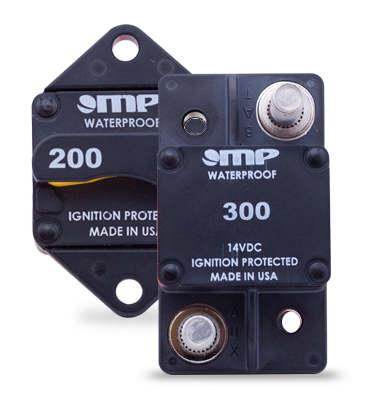 MP Short-Stop and Hi-Amp protectors certified to SAE J553 and Ignition Protection SAE J1171 (3- 300 amps) provide unparalleled protection for Chassis Vehicle circuits. While the durable Series 16 thru 70 amps has proven ideal for Military Vehicle accessory circuits. How do I reduce case cracks and breakage in surface mount devices? 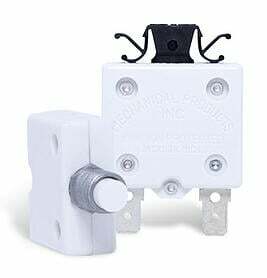 Unlike competitive devices that are made from thermoset material, MP’ s Hi-Amp Circuit Breakers (Series 17, 18 & 19) are molded using high temperature thermoplastic that is very resistant to cracking and breaking. How do you reduce terminal corrosion in harsh environments? Many MP J553 qualified circuit breakers automatically come with stainless steel terminals and hardware. Why is the S16 popular for protecting Vehicle Accessories? 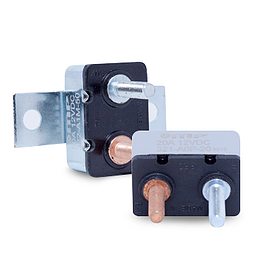 The legendary performance MP circuit breakers are known for started with the Series 16 (0.5 – 70 amps). The compact push to reset protector is the number one economical choice for harsh applications like Military Vehicle accessory protection. How do I protect Short-Stops from being damaged? MP’s Series 32 Short-Stop Protective Boot is available to guard against fluid splashes and terminal-to-terminal short circuits. Do you accept large wire terminations in Hi-Amp applications? MP surveyed user before designing its Series 17 Hi-Amp. The Series 17 surface mount is offered in ¼” and 3/8” stainless steel terminals with extra-large terminal pads to easily accommodate virtually any required wire termination. Do you have a robust VDC circuit breaker for Military Vehicles? 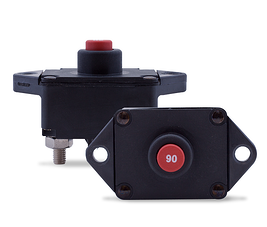 The Series 18 is designed thru 60 amps for harsh environments. 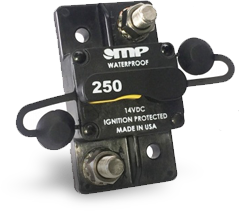 This weatherproof device is certified to perform under conditions of shock, vibration, salt spray, humidity and short circuit conditions, with the Series 17 and 19 also available through 300 amps.